Lately I have been concentrating on finding the current & power limits of the Argon drive. I have used the artificial load unit as test load. Testing has gone well and has revealed things I didn’t know about Argon. The most positive surprise is that the drive seems to be able to deliver a lot more continuous power than calculated. The first anticipated limiting factor in the design was the equivalent series resistance (ESR) of the bulk capacitors. 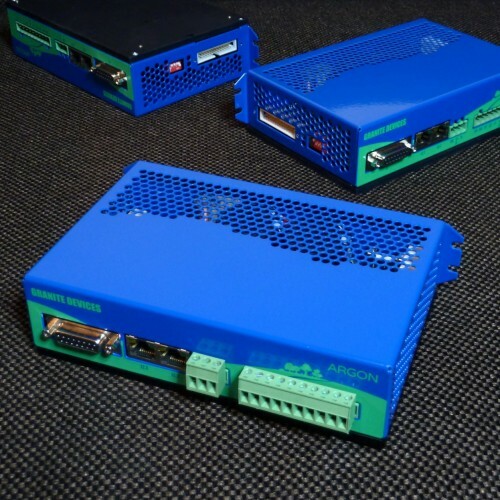 ESR sets the limit to the maximum ripple current that AC-to-DC power supply can handle because current flowing through capacitor’s internal resistance will heat them up and eventually make them reach their maximum safe temperature. By calculating maximum ripple current & power based on capacitor specs I came up with figure of 700W continuous power before capacitors get too hot (105⁰C). However, by testing I found out that even at 1200W continuous output the caps didn’t get warmer than 37⁰C. I think capacitors either are way better than specified or their ESR is specified at 105⁰C which may be much higher than the ESR in room temperature. So 700W is probably the limit when capacitors already run hot (needs very high ambient temperature) and at least 1.2kW may be extracted at room temperature. We finally have received the samples of enclosure consisting steel sheet metal cover and aluminum heat sink plates. So the front panel art comes with trees as voted best in the previous posts. My thanks to everyone giving comments to that post! It really helped us to make the best choice. Argon prototypes with industrially made covers. LED numbering texts (above the RJ45 sockets) were mistakenly forgotten from the front panel art. The cover slips on smoothly unlike the first self made prototype which required bending one side in order to install it on the device. The realized design looks and feels very solid and leaves only little space for improvement. However, few improvements will be carried out mainly to help assembly, most of them being related to threading for mounting screws and adding more accuracy to bends. To the final design I’m also considering to add an placeholder hole for possible extension port that could be installed inside the drive as stack-on circuit board. Extension boards could be made by end users, third parties and of course by us. Today I went into the lab to repeat some surge tests that let the smoke out of Argon’s on-board voltage regulator the last time. This time some circuit modifications were made as attempts to enhance the surge voltage & current handling. Surge test attempts to emulate a lightning strike. The surge tests are typically more difficult to pass than ESD & EFT due to high injected energy and currents. For instance 500V and 2Ω produces current of 250A and 1000V 2Ω yields whopping 500 Amperes. That will heat up the overvoltage protectors quite extremely and weaker components simply explode. Now all tests passed without damage and motor was servoing simultaneously through the whole test. Changes will be brought to the PCB design which makes a big step closer to the final design. I hope our followers have had a restful Cristmas break and joyful beginning of the new year! Anyway, time to get back to the business. The photo below shows the artificial load unit to be used in Argon production testing process. In other words it will be used to simulate heavy load for drive power stage electronics to separate the wheat from the chaff. Artificial load (work in progress). The most of energy goes into the flat power resistors mounted on the sides of the heat sink block. 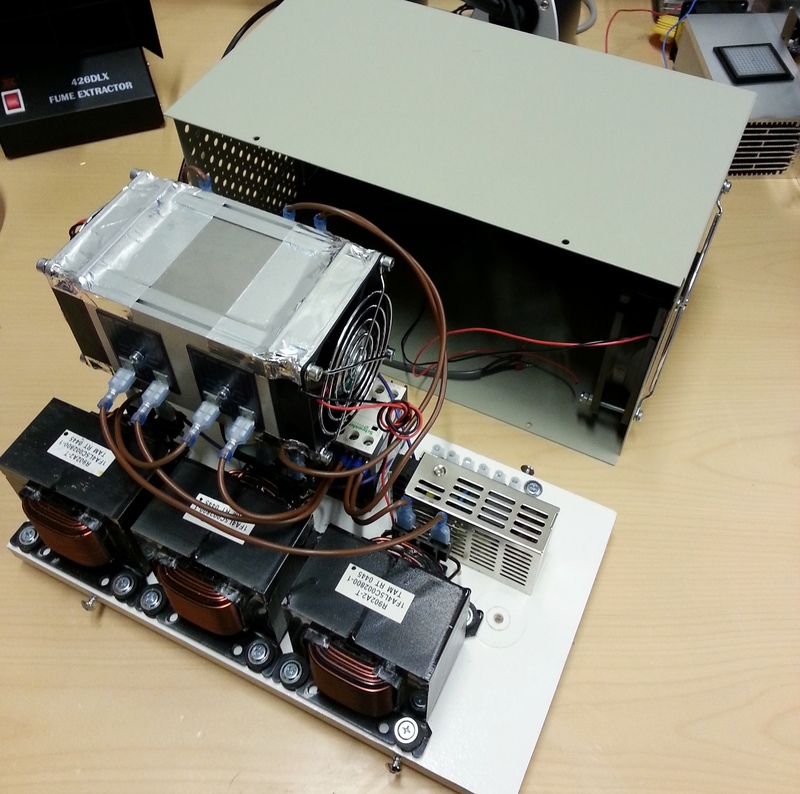 The unit consists of three inductors and three power resistors forming a 3 phase load that simulates a motor stator. In the same high density heat sink there is also a fourth power resistor that provides load for regenerative resistor IGBT switch. Other stuff inside provides power for cooling fans and contactor that safely disconnects the load in case of over heating. 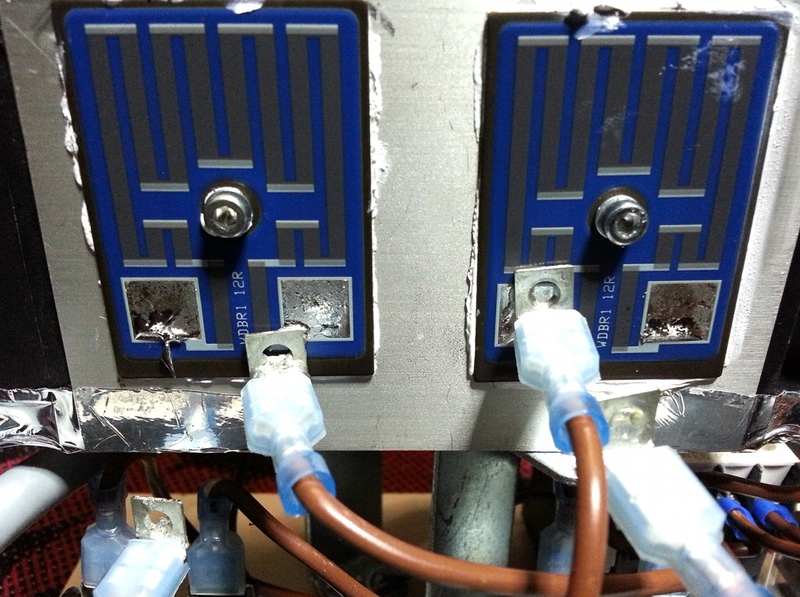 The two fans in the heat sink are installed in push-pull configuration for maximum air flow.